June is plum season in California… or at least the season for wild plums. Every year is of course a little different, but for us plum time is normally from mid-June until early July. It all depends on how hot it’s been, and whether or not our area has been blessed with late rains. Almost every part of the United States has some sort of wild plum, or at least something similar within the larger prunus family, which includes things like peaches and cherries and apricots. 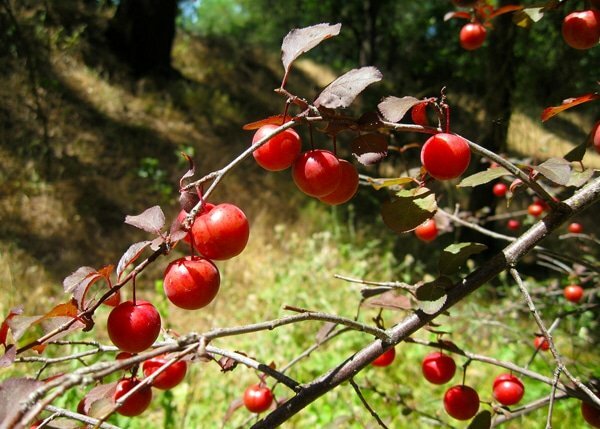 Finding your very own wild plum trees can be something of a treasure hunt. The easiest way to locate them is to scout in early spring, when the trees are in bloom. Why so early? You might think it’d be plenty easy to spot a plum tree loaded with so much scarlet fruit it looks like a Christmas tree. It actually isn’t. Most wild prunus species are understory trees hanging out beneath larger hardwoods. A lot of them are actually more like woody bushes than proper trees. I’ve missed a great many of them even while searching, especially those with yellow fruits; yellow fruit blends well with green leaves. I’ve written about foraging for wild plums before, taking special note of the suburban ornamental cherry plum, whose fruit is the color of a bing cherry and tastes almost as good. I like to make plum pies from them, and they also make a great infused vodka. My advice is to take a walk around when the trees are in flower, which is February in NorCal. 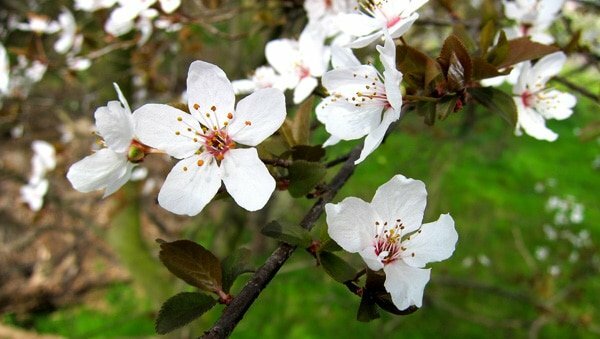 Look for the tell-tale prunus flower. When you see flowers on trees that look like this, you are in business. Remember where the tree is, and you will be rewarded with some sort of fruit. I have a hard time telling apart plum flowers from wild cherries, pears or even wild apples. But they’re all good, so who cares? Guard your trees. Everything and everyone wants to eat “your” plums, which of course aren’t actually yours. Once the fruit begins to color, check the patch frequently until most are sweet. They are supposed to be tart, by the way. If you wait until wild plums are as sweet and insipid as supermarket plums, you will be sad — because something will have already eaten them. One of my patches, which shall remain nameless, is in an area you are not supposed to pick in. So when I harvest fruit in this area, it feels a little dirty and exciting: I sneak in when few people are around, pick as fast as I can, stuff the plums in my pack and nonchalantly exit said location quickly. Make eye contact with no one. Look casual. For some reason illicit fruit always tastes best. As for the plums themselves, well, they are small and the fruit clings to the pit closely. So if you plan on doing something with them other than snacking, you will need to deal with hundreds of little pits. My advice is to freeze the plums whole. Once thawed, the pulp softens dramatically and will slough off the pits easily. Or you can use a cherry pitter for dealing with them fresh — but be sure to have a stout one, as these plums are a shade larger than cherries and will tax a weak pitter. What to do with your plums? Pretty much anything you would make with domestic plums. 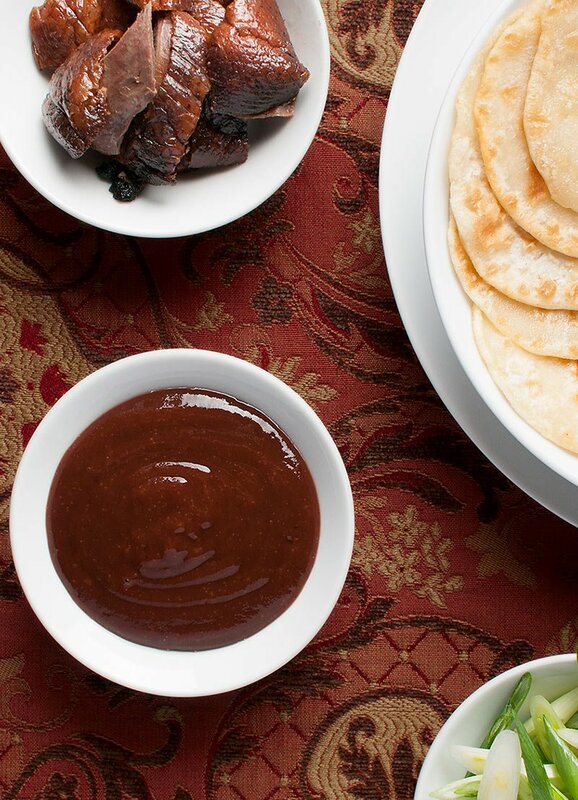 Chinese plum sauce is one of my favorite ways to save the harvest. This homemade stuff kicks the crap out of that weak, overly sweet and flaccid supermarket variety. Think of this as an über powerful Asian BBQ sauce. 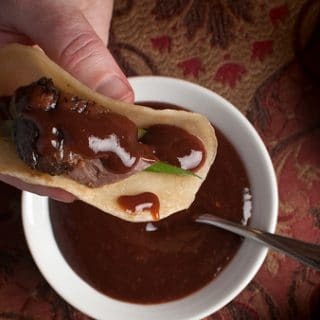 Serve it alongside simple grilled meats, barbecued brisket, or as a dipping sauce for Peking Duck (or regular roast duck, for that matter). If you want to skip the meat, adding a thin layer on Chinese scallion pancakes is insanely good. If you have some plum sauce around — this recipe keeps a long time in the fridge, and can be canned — you have a party in a jar… and nothing’s better than a party started with forbidden fruit. 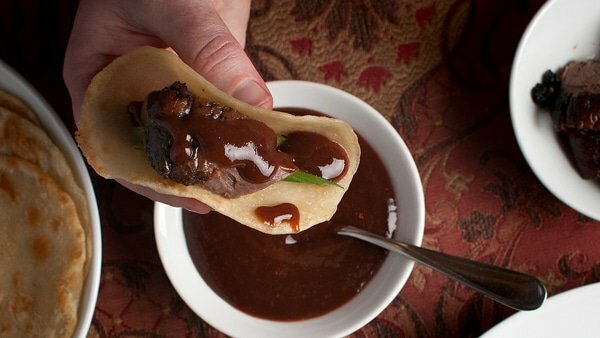 There are lots of versions of this sauce, but this one is pretty simple, relying on only a few unusual ingredients: The chile bean paste seems hard-to-find, but it's available anywhere there is an "Asian Section" of a supermarket, and I've seen them in lots of small towns, so just check. As for the plums, use what you have. I have access to lots of wild plums, but domestic plums are fine, as are those cool ornamental plums you see as landscaping trees in warmer climates; they're the deep red-purple trees, leaves and all. The plums are the same color as the leaves. You will need to pit the plums sooner or later. 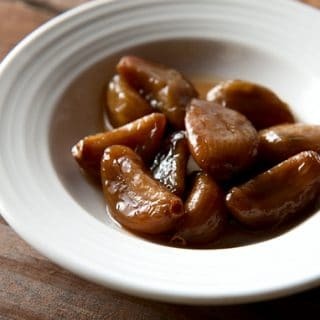 If you are using domestic, freestone plums, cut them in half and pop out the pit. Most plums, however, have fruit that sticks to the pit. In this case, you can do one of three things: Use a cherry pitter to remove the pits; slice and cook, then strain; or freeze the plums whole to soften, then cook and strain. Freezing loosens the fruit's grip on the pit. Either way you will need some way to strain the pulp from the pits. I use a simple food mill. I cook the plums in two stages. In the first stage, I put just a little water in the bottom of a heavy pot and add all the plums. Turn the heat to medium and, once they are simmering a little, use a potato masher to squash them as they cook. Keep agitating the plums as you simmer them gently -- you will probably need to turn the heat down at some point -- until most of the flesh comes off the pits. This takes about 20 to 35 minutes. Move all the plums to a food mill. Pick out as many pits as you can right off the bat. Mill the plums into a coarse puree, removing pits as you go. 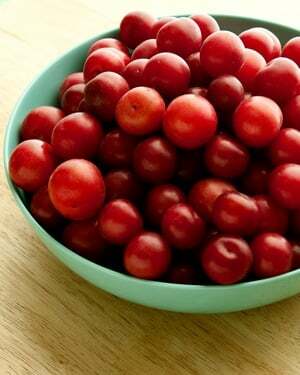 This is actually really easy with domestic plums, as both the pit and the plum itself is larger than its wild cousin. Wild plums are only about the size of a large cherry, so this stage will take a bit longer with them. Once the cooked plums are free of pits, return them to the pot along with all the other ingredients. Simmer gently for another 30 minutes, until all the flavors are melded and the garlic, shallot and ginger have softened. Pour everything in to a blender and puree until smooth. Your plum sauce is now ready, and it will keep for about 6 months in a sealed jar in the fridge. If you want to keep it in the pantry, you will need to water-bath can it. Use clean jars and new lids and process for 15 minutes. My advice is to use half-pint jars, as a little of this sauce goes a long way. Once canned, the plum sauce will keep for a year or more in the pantry. You’ll find lots of recipes for wild plums and other wild fruits right here on Hunter Angler Gardener Cook! I have a dwarf red plum tree which produces fruit with a metallic taste, especially if not very very ripe. Jam preserves or canned plums have this metallic taste too. I had the same problem with local wild plums. I use stainless steel pans, not aluminum to process. I live in northern Minnesota and we have very high iron content in our well water. Any suggestions? Do I peel the skins off the plums as well as pitting? Can i freeze the sauce?